Keeping an office space neat and tidy is essential when it comes to working environments whether it be for a home office or a corporate office. 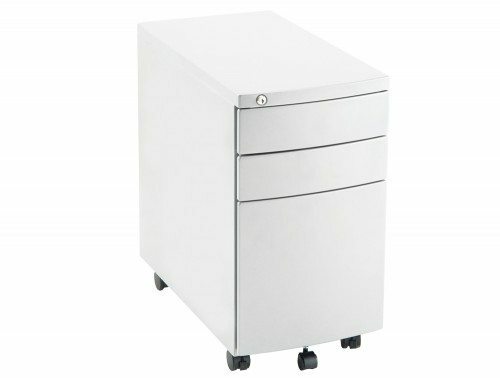 Pedestals are an excellent way to extend your office storage capacity and help reduce clutter in your working space. An easy and flexible storage option are desk storage units. They are highly ideal and can be fixed or mobile to suit your preference. 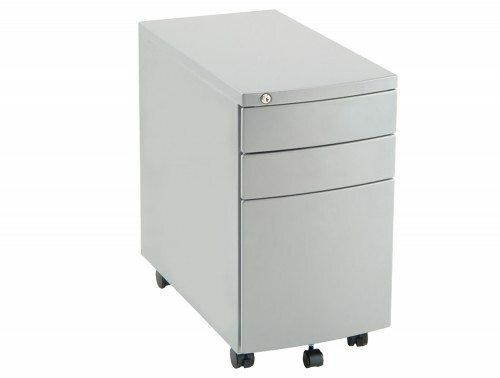 Under desk pedestals are convenient storage space for papers, files, office stationery and other items. 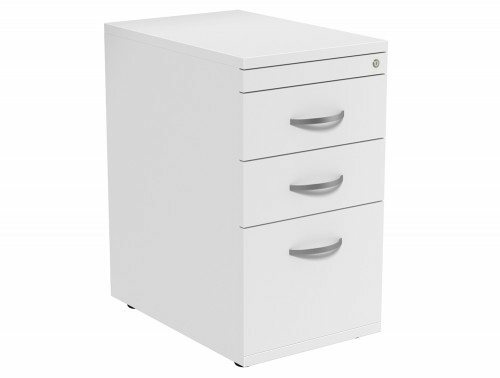 A variety of our storage units offer multiple drawers and have a fully lockable mechanism, ensuring safety for all your important files and belongings. 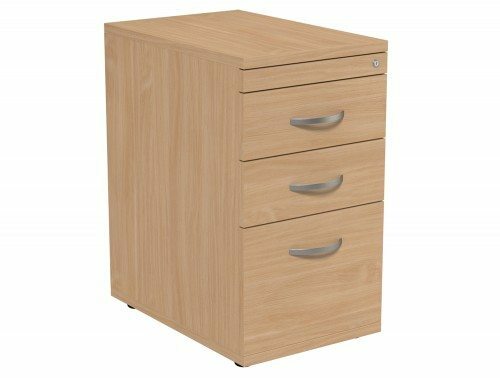 Our filing cabinets storage range comes in an array of wood finishes and styles. 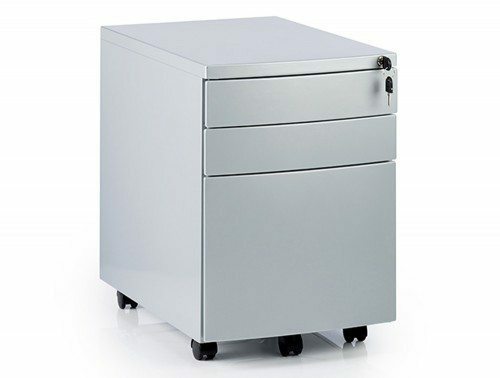 Our range includes part open pedestal cabinets, lockable storage units, metal drawers and under desk pedestals. You have a choice of steel or a selection of wood finishes like beech, maple, oak, zebrano, walnut and many more. For a more contemporary look, we recommend our steel range and if you prefer a softer look then the wooden pedestal design would be best suited for you. 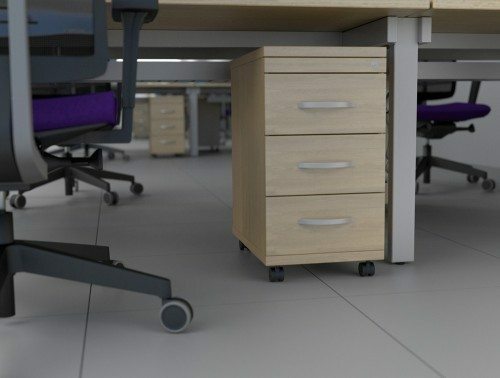 The office storage models in our catalogue can come in standard design, slimline or tuck under with different sizes to suit your preference. The storage drawers in our metal drawer range can come in a single drawer, 2-drawer or 3-drawer depending on how much storage you need. For quick and easy movement, a range of our mobile pedestals are incorporated with castor wheels. The wheels allow for greater flexibility and practicality. 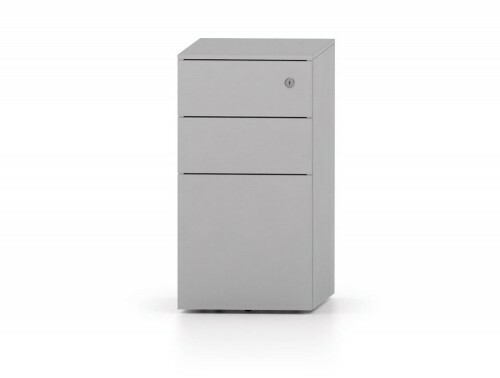 It enables the users to move a variety of storage units around the workplace smoothly. 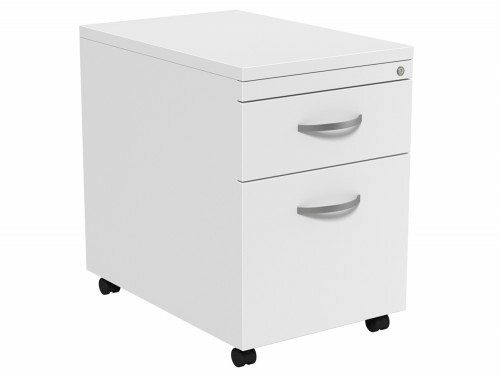 Filing cabinets with castor wheels are particularly well suited to open-plan office spaces. 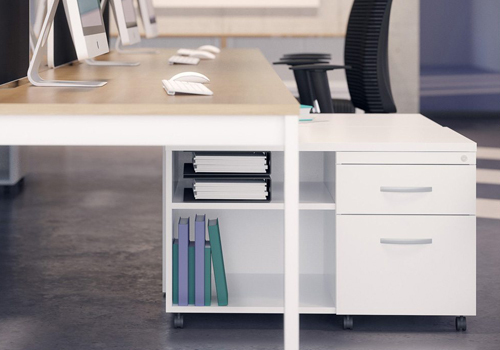 Our wide range of storage solutions are designed by some of Europe’s finest furniture manufacturers including Trexus, Buronomic, Steelcase, Oplan, and Ashford. Sourcing our furniture from these well-established brands can help us guarantee that you are getting high quality, durable and stylish designs for your money. 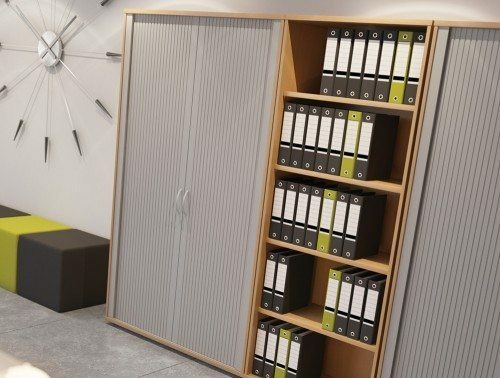 A large selection of our office storage units come with a warranty period, guaranteeing its quality and continued functionality for that period of time. The products have also been thoroughly tested, ensuring it meets the standards required for both home and office use. A cluttered office can be highly distracting for employees. Clearing the office of clutter is one of the essential steps towards better-performing employees. After all, a clear office equals a clear mind. Luckily for you, Radius Office Furniture offers a wide selection of storage units to help keep your office space as neat and tidy as possible. Pedestal cabinet units provide the perfect solution for those who don’t wish to have storage fitted permanently to their walls. 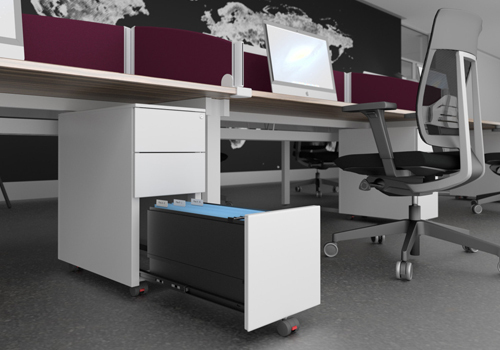 Pedestal storage provides a far more flexible approach, enabling the user to move the unit into the position that best suits their individual needs. The wooden and steel finishes available in our e-commerce website are highly durable and can withstand lots of movement. 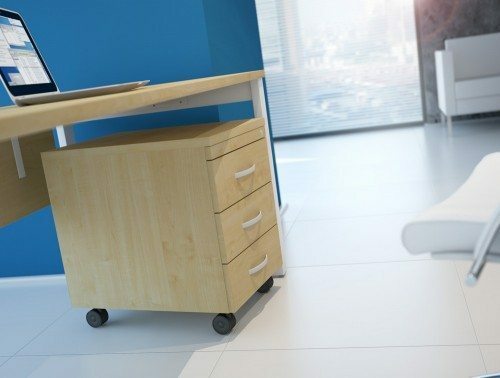 Designed to be mobile and fitted with castors, they can be moved quickly and easily whenever you need a change of layout in your working space. 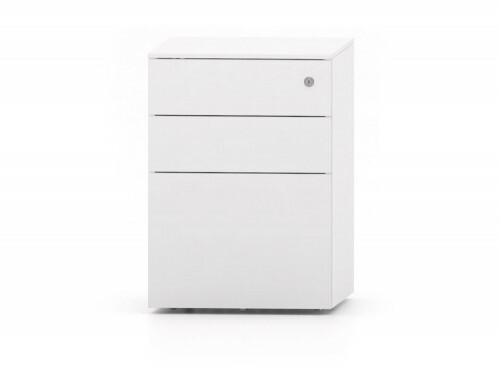 You can also get a fixed desk drawer unit to give your basic desk a permanent makeover. 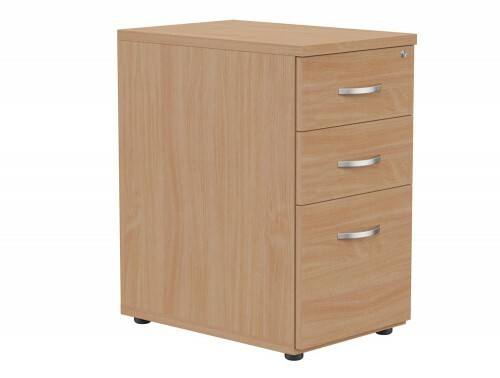 The handy extra storage space provided will surely benefit you and keep your desk neat and tidy. 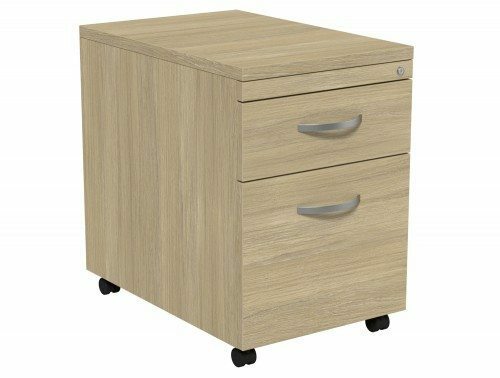 It’s important when buying office storage to choose the right number of levels to accommodate for all of your office stationery and equipment, that’s why a selection of our desk drawers boasts 2 or 3 drawer units. 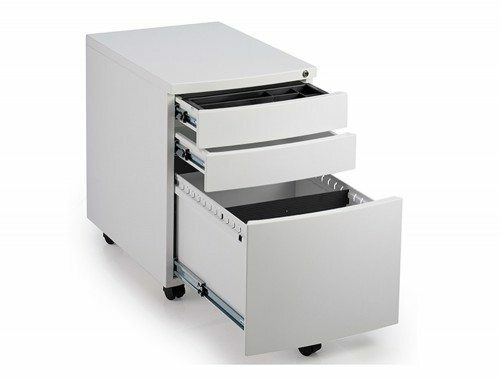 The distinct slide-out drawer spaces are great for segregating files and different stationary lying around the working area. 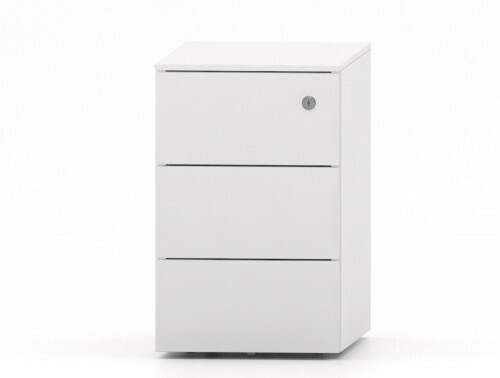 Some filing cabinets units are offered with a label holder which enables the user to keep tabs on the contents of their drawers. These storage units are also easy to maintain and clean. The steel and wooden finishes are highly resilient and durable. The wooden finish can add a natural gorgeous look to any office space while a high gloss steel finish can bring a more modern and contemporary feel. Many of our designs are highly practical and can cater to different needs. 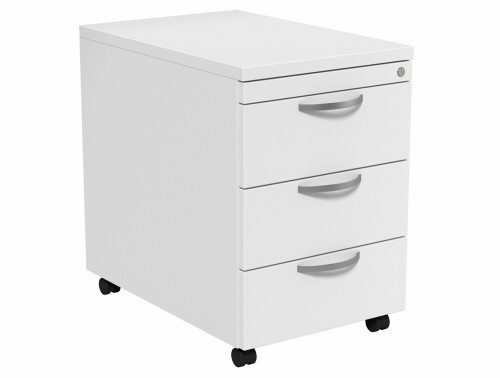 For example, a selection of our under-desk mobile storage drawers is offered with a cushion seating design. 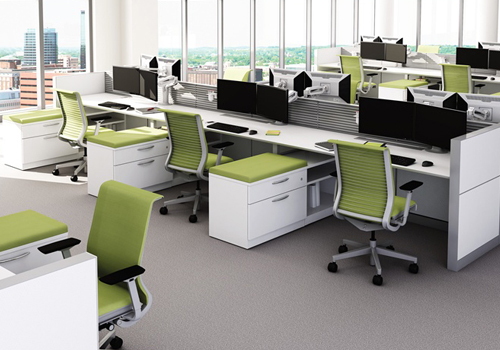 This provides extra seating around your desk for quick exchanges with colleagues during the working day. 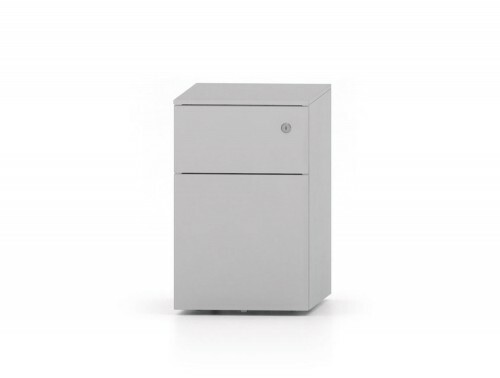 Our part- open pedestals are a handy addition if you are looking for a storage unit with easy open access as well as a lockable storage unit. 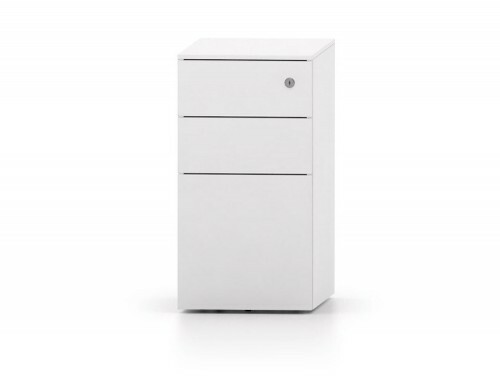 The desk storage unit with a part open design can be customised to your demands regarding which side you want the open storage part to be, either the left or the right. 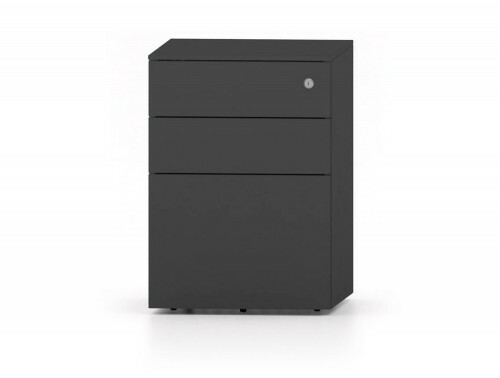 The narrow slim line design is ideal if you are looking for a storage drawer with more depth rather than width in size. 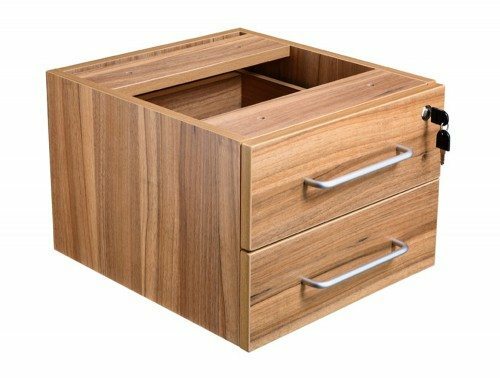 It is perfect if you are looking to save space but still want a storage drawer with a substantial storage capacity. Lastly, the desk high pedestal designs are a great addition if need same height storage unit as the desk. Here at Radius Office Furniture, we understand that price is a big deciding factor when it comes to purchasing furniture, that is why we offer an array of office storage drawer units at very affordable prices. Our catalogue offers used pedestal units in great conditions if you are looking for a cheap storage solution. 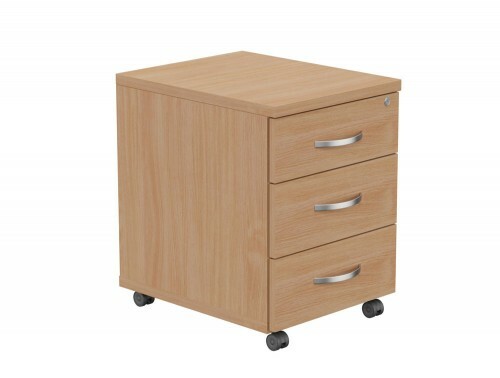 Alongside this, we offer more high-end pedestal storage units with some extra features. Whatever type of storage unit you are looking for to help you de-clutter your office, you can be sure to find it in our extensive pedestal selection. If you’d like to find out more about our range of Pedestals or discuss your requirements, simply request a callback.